The Sun Affects Mars Also! One of SDO’s main science goals is to study how the changes in the Sun (solar cycle, flares, etc.) drive changes here at the Earth, a subject called “Space Weather”. Guess what? These solar events also drive similar changes in the atmosphere of Mars! There is a mission to Mars called the Mars Atmosphere and Volatile Evolution Mission (MAVEN) that is currently being built and is set to launch to Mars in late 2013. One of MAVEN’s instruments is an EUV monitor, which is a very simple version of the SDO EVE instrument, and it will measure the solar irradiance output and its variations at Mars. Other complementary instruments will also be looking to see how much these solar variations directly influence the Martian atmosphere. 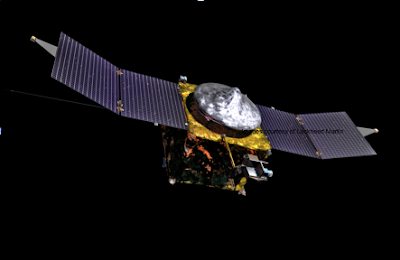 One major goal of the MAVEN mission is to determine how much the solar variations affect the temperatures, densities, composition and the rate of loss of the Martian atmosphere today. These measurements will then be used to determine how dense and what the composition of the atmosphere of Mars may have been in the past! The lead institution for MAVEN is the University of Colorado’s Laboratory for Atmospheric and Space Physics (where SDO/EVE was built!) and the MAVEN PI is Bruce Jakosky. NASA Goddard Space Flight Center, where SDO was built and managed, is also managing the MAVEN mission. Wired.com just released their own "Best-Of" list for SDO's first year of data. Happy Birthday SDO! Keep up the good work. During the EVE cruciform on Wednesday the CCD used to observe AIA 304 and 94 channels was baked out. This means it was heated to drive off contaminants and no images were recorded. People have pointed out that the HMI Latest Images have not been update since the beginning of the cruciform. This is being looked into and should be fixed soon. 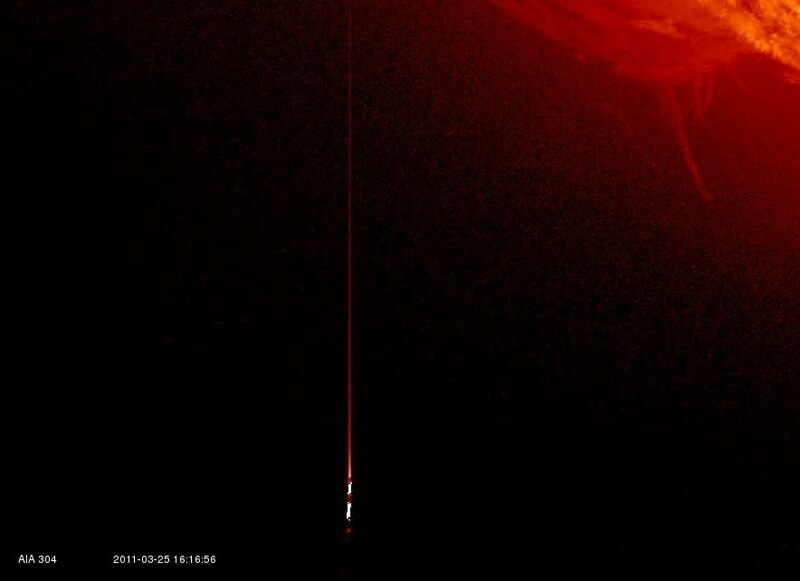 SDO will perform the EVE cruciform maneuver tomorrow, April 13, 2011. Between 14:15 and 23:05 ET (4/13/2011, 18:15 UT and 4/14/2011, 03:05 UT) the satellite will trace out a plus sign with the Sun at the center. The satellite will pitch first and then yaw by 150 arcmin in each direction. At 16:16:08 UT on March 25, 2011 and again at 16:17:08 (see on left) bright flashes were seen in the lower left corner of images in the AIA He II 304 bandpass. There has been some speculation about the cause of these flashes. They are proton hits on the CCD that records the images in this telescope. As the proton moves through the CCD it ionizes the silicon and leaves electrons in its wake. Proton hits are a main cause of hot pixels or spikes in any space-based CCD. They are often seen in images recorded by the LASCO coronagraphs on SOHO. SDO instruments have shielding to keep the low energy protons out of the CCD, but as solar activity picks up the number of hits by high energy protons will increase. 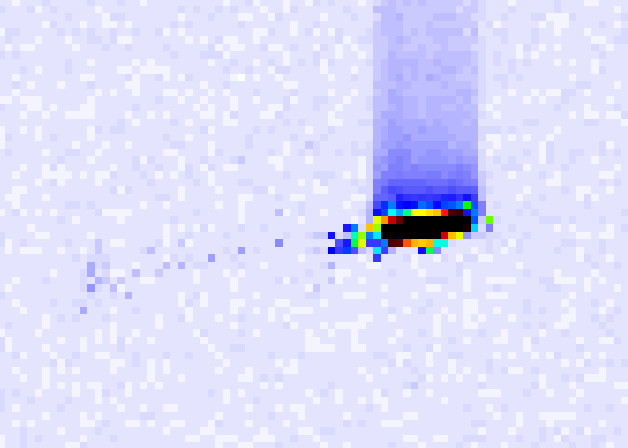 When you go to the original FITS data from 16:16:08, enlarge the image (left), and apply a rainbow color table that maps small values to blue and large values to red, you can see the some pixels with electrons caused by the proton before it slowed enough to have the large ionization signature. In these examples the number of electrons left behind is so large the CCD pixels can’t hold them and they bleed into adjacent pixels, causing the funny shapes. Because the pixels are completely full the electrons are not completely shifted from pixel to pixel during the bucket brigade we call readout. This remnant charge causes the long vertical tail as that extra charge is slowly removed. This part of the CCD is read out through the lower left corner, so spikes in this part of the CCD always have the readout tail straight up. Each instrument on SDO must remove the spikes from their data during data processing so that only solar information is sent to data archive. Because we get the images before the final reduction is done we get to see the spikes. Could they be interstellar spacecraft? No. Only light with a wavelength very close to 304 Å is passed by the filters in front of the CCD of this telescope configuration. At this wavelength metals do not reflect light very well except at grazing angles. This principle is used to construct grazing incidence telescopes on Chandra and Yohkoh. But this means you would see an object in reflection only as it passed in front of the Sun. Neither feature in these images is in such a position. We do not see interstellar “Iridium flashes” in the SDO telescopes; we do see protons hits on the CCDs. Today between 0554 and 1234 UT the SDO spacecraft rolled around the axis that points toward the Sun. This produced some oddities is the displayed images but the rotation angle was removed before the images were placed on the website. Rolls are done to help understand and calibrate the instruments. Although we can easily tell when we are pointed at the center of the Sun, without any continents on the Sun it is quite difficult to know how accurately the images are aligned with solar north. Rolls provide the extra information needed to align the instruments on the Sun. Next maneuver is the EVE cruciform next week. What's Up With the Sun on March 29, 2011? Two topics need to be covered this week. We'll do one today. What happened while SDO exited the eclipse on March 29? 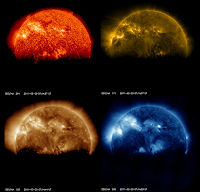 The pictures at the left show images in four AIA wavelengths (304, 171, 193, and 335) at about 07:14:50 UT Tuesday. The edge of the Earth is the ragged line across the southern hemisphere of the Sun. Where is the sharp line seen in the HMI movie from the FirstLight gallery or the edge of the moon in a lunar transit? The answer is a combination of atmospheric absorption and color tables. The sharp line in HMI is in the visible spectrum and emphasizes the thinness of the troposphere that we live in. Light at the EUV wavelengths of AIA is completely absorbed much higher in the Earth’s atmosphere (at an altitude of about 300 km at the limb). Even small amounts of atmosphere remove the light from the picture. Then the image is processed into an image we can see by changing to a log intensity and scaling to a color table. The log intensity makes the bright bits and dim bits visible in the same image but over-emphasizes the dim background. Even a little absorption is enough to cause a dim region to drop to below the minimum intensity allowed in the color table, hence the irregular border that traces out the dimmer regions seen in the following uneclipsed image. Eclipse season ends Saturday, so back to images 24/7 on Sunday. Next topic: protons, hot pixels, and interstellar spaceships. EVE Sounding Rocket Videos Posted! Andrew Jones' (EVE Scientist) short versions of NASA 36.275 videos from internal cameras on-line - With SOUND! My browser doesn't start the movie but instead downlinks the video - which then can be played on your computer or from iPhone.